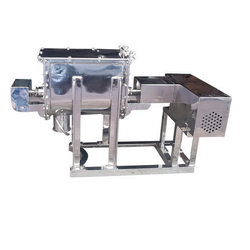 We are a leading Manufacturer of ribbon blender from Mumbai, India. Motor 1 H.P. to 70 H.P. We are a well known manufacturer and exporter ofRibbon Blenderwhich is available in U-shape or cylindrical shape according to internal pressure and vacuum requirement. The blender is used for constant speed & precise mixing of dry and semi dry powders. Our clients can also avail from us spiral type ribbon blades for triple way mixing with Jacket - Cooling / Heating arrangement. These are available in M.S. & S.S. & GMP models with the capacity of 7 KL.